When it comes time to have a new heating and cooling system installed in your home, you have numerous options to consider. Heat pumps are rapidly growing in popularity and can be an excellent choice to provide both heating and cooling for your Northern Virginia home. Millie’s Heating & Air Conditioning carries a great selection of Carrier and Amana heat pumps, and our professional technicians can install them for you properly and efficiently. Heat pumps offer several benefits over some other types of home heating and cooling systems. To begin with, they provide both heating in the winter and cooling in the summer, making it possible to install only one HVAC system in your home instead of two. Modern heat pumps are quite effective at providing adequate heating even when the outdoor temperatures get very low, so you can rest assured you will be comfortable and cozy in your home all winter long. Heat pumps also provide a constant stream of warm air rather than the larger blasts of hot air a furnace delivers into your heating space. While the overall effect is to maintain the same temperature, the way the heat pump goes about doing this makes for a more comfortable and consistent indoor environment. And because heat pumps do not actually generate the heat they are circulating, they require much less energy to run than other types of home heating and cooling systems do. No matter what type of heat pump you get, it is very important that it is sized professionally by an experienced technician. That is because a heat pump that is too small for the space will struggle to maintain the right temperature. It will also break down more frequently, wear out more quickly and cost more to run than one that is the right size. That does not mean you should just go out and get the largest heat pump you can, though. A heat pump that is too large for your home will cost extra on installation, use extra energy to operate and cycle on and off too frequently. It also will not be able to keep your indoor temperature steady and will cost you extra money in the process. When you have decided that a heat pump is right for your home, our professionals are here to help. We will work closely with you throughout the Ashburn heat pump installation process to make sure the one we put in for you is the best fit to the dimensions of your home and the needs of your family. And we will keep you informed about our progress and the status of the project, so you will know what to expect going forward. 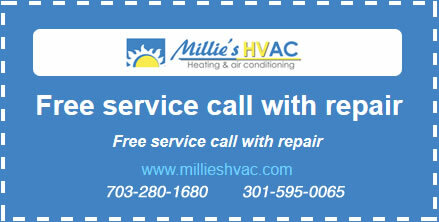 Do not hesitate to give Millie’s a call today to learn more about our professional Great Falls heat pump installation services or to set up an appointment for service.